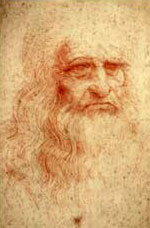 The special Leonardo da Vinci exhibit "The Mind of Leonardo, The Universal Genius at Work" is open now at the Uffizi and will run until January, 2007. We have not been to see it yet but I plan to before we leave for the summer. You can read some more about the exhibit here and the official page from the Uffizi is here (looks like they still have it in Italian only). If anyone who reads this sees the exhibit please leave us a comment!